FlexSecret is a complete dietary supplement for the joints. FlexSecret may boost joint mobility, increase joint flexibility, support joint structure, protect joint tissue and reduce inflammation. FlexSecret can ease the pain and discomforts that come with age, weight or athletic deterioration of the joints in the body. All natural & Non-GMO, FlexSecret is gluten free, diabetic safe, dairy free, soy free and shellfish free, with no hormones, no antibiotics, no preservatives, no yeast, no sugar, no cholesterol, and no artificial colors or flavors. Think of healthy cartilage as a brick wall. Then imagine glucosamine being the bricks and mortar as chondroitin. An aging brick wall will eventually begin to crumble. For best results, you need a bricklayer. That's where FlexSecret comes in! Maximum Strength FlexSecret takes a different approach to joint health. Preliminary studies suggest FlexSecret helps to stimulate your body’s natural ability to produce key joint health and cartilage matrix substances and may help inhibit certain genes that can accelerate aging of joints. ✅ POWERFUL JOINT PAIN RELIEF - FLEXSECRET"S formula is designed for anyone who has joint pain, joint stress or experiences joint stiffness. The powerful nutrients may help to maintain joint flexibility. FLEXSECRET works for Men, Women and Seniors. ✅ GET YOUR LIFE BACK - Improve your joint health and find relief from minor arthritis pain, knee, neck, hip, ankle, shoulder and elbow pain in as little as one week with a daily dose of FLEXSECRET. ✅ FLEXSECRET INCLUDES MACA POWDER, L-LEUCINE, CAT'S CLAW AND BOSWELLIA SERRATA EXTRACT, a unique and effective foursome of botanicals for cartilage health, joint health, comfort and flexibility support, and a healthy inflammatory response. 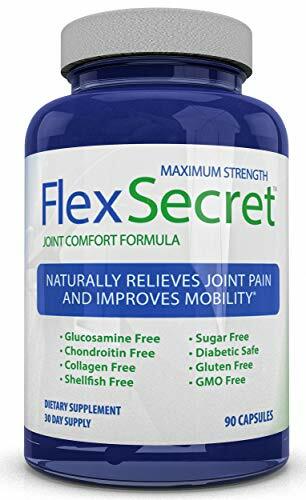 ✅ FLEXSECRET MAY STIMULATE YOUR BODY'S NATURAL ABILITY TO PRODUCE GLUCOSAMINE, CHONDROITIN AND COLLAGEN and helps inhibit certain genes that can accelerate aging of joints. ✅ PREMIUM QUALITY SUPPLEMENT MANUFACTURED AND TESTED IN THE USA in FDA inspected, GMP-certified Facilities and includes our 100% No-Hassle MONEY BACK GUARANTEE. Get relief from the discomfort of join pain and inflammation, or you money back! If you have any questions about this product by Sorvita, contact us by completing and submitting the form below. If you are looking for a specif part number, please include it with your message.